The results are in from the disgrasianation-wide vote over this video “homage” to William Hung. Boy. You guys are tougher than we are! 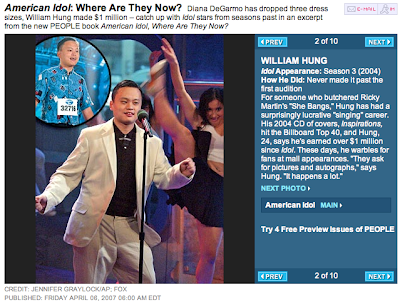 People.com just did an American Idol “Where Are They Now?”, which reported that William Hung has made $1 million smackers since never appearing on the show. Was it worth it, Hungster? Was it, really? WILLIAM HUNG: Hello! Look at here I am stand with national star of basketball league, Yao Ming. 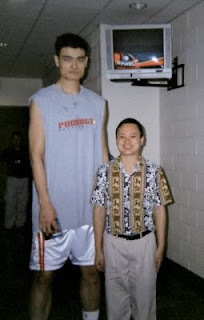 YAO MING: I can’t believe I am being photographed with this snaggle-toothed, midget attention whore. Tomorrow I fire publicist and agent. WILLIAM HUNG: Is it not very funny that he is such tall man and I am much small? YAO MING: Please don’t speak. WILLIAM HUNG: How many touchdown you make playing with Houston Rocket? YAO MING: I thought you studied at Cal? WILLIAM HUNG: I am college drop out. No room for test tube station when I am fight alllll lovely ladies off William Hung! Hung is in the howwzza wowza! I star in music video wazzzzup!!! YAO MING: I’m an NBA All-Star. I’m a VISA spokesperson. I know Steve Jobs. WILLIAM HUNG: I like purple! YAO MING: Just take the picture.